In order to be able to start the reception of all receivers at least roughly at the same time (recommended is within 100 ms), it is required to configure SSH for key-based authentication instead of the default password-based login. For that purpose the user at the master (client) generates a pair of keys once. Then the public key is copied to the Rasperry PIs (server). Lots of good and detailed tutorials can be found in the web. 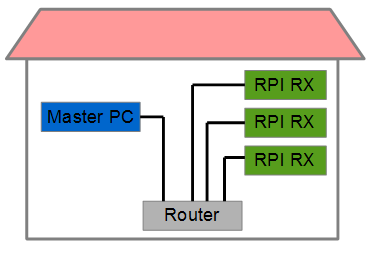 First, the master needs to know the public IP address of the receiver LAN’s router. Note, that usually the public IP address changes from time to time. For comfortable operation a “dynamic DNS” service can be used, such that the router can be accessed by a fixed domain name (e.g. a_router.something.org). Second, the router of the receiver’s LAN needs to be configured with port forwarding to make the receiver accessible to the public internet. Port forwarding simply maps a network port at the router to a device (PC, Raspberry PI) behind the router. Example: Router address (public) is 1.2.3.4, receiver LAN address is: 192.168.0.99, port configured by port forwading: 1111, then the receiver is publicly accessible with 1.2.3.4:1111. Port forwarding needs to be configured in your router settings, the exact procedure is dependent on your router model. If one of the receivers is located in a non-private network, such as in a company, mobile network (3G, LTE etc.) or in another network, for which you do not have any administration rights, establishing a SSH connection is more difficult. One possibility requires an external online server. The Raspberry PI connects itself to that server to open a SSH tunnel (reverse tunneling). Further action may be required, such as applying autossh to keep the connection open. After reception the files can copied to the master with the scp command.